So meanwhile...did I tell you about...: Proof that old habits die easy! I did the dishes while making tea AND washed our plates up straight after so there's not one dish left to do!!! Now this may not seem momentous enough to write a blog post about...in fact most of you are sitting back going 'ah, that's what we do every day.'!!! But for those who have known us since we moved out - you'll realise that's a fairly spectacular effort really! 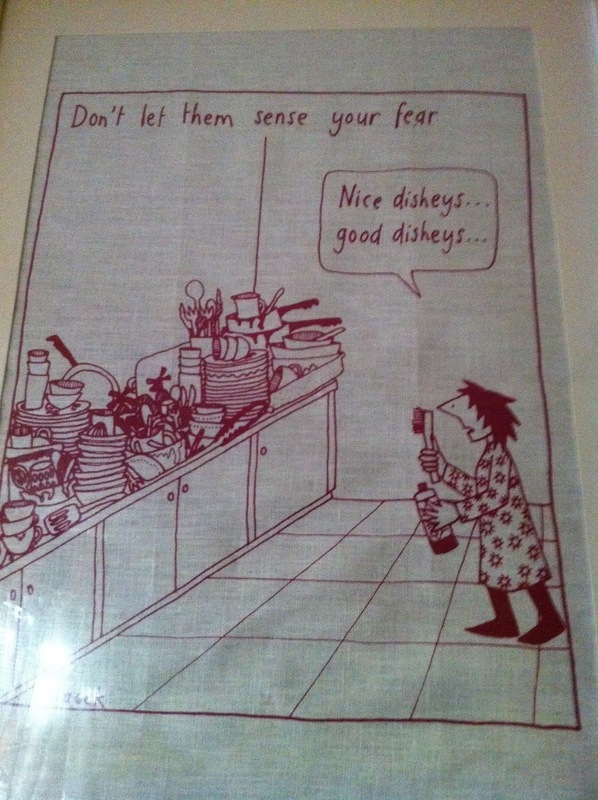 Here's the framed tea towel we have hanging above our sink - partly as an ode to our to the kitchen in our first flat which got to this exact state by each Saturday and also as a reminder not to get back to that! We've definitely gotten better over the years, but there's still been many an occasion when the poor dishes were left to their own devices while Nathan & I secretly hoped that the other would tackle them. Funny really, because I'm always happy to do other people's dishes, just didn't used to jump at the chance to do our own! Anywho, Nathan & I decided a month or two ago that we were sick of our slightly slovenly ways, and decided to do something about it across all areas of the house. And just quietly, we're doing a great job! Bit by bit we're actually becoming proper grown-ups and keeping our house tidy on a full-time basis! So the moral of the story is that you can change old habits, and contrary to popular belief - they can and quite often do die easily! It doesn't matter how long you've had them for because all a habit or belief is, is just a thought you've chosen to think over and over (a lot of the time subconciously). So all you need to do is pick a new thought that makes you feel better, or supports your life moreso and practice, practice, practice - in thought and deed! The trick is not to berate yourself while you're learning your new way of being...as good old Louise Hay says, it's just like planting a seed. You don't jump up and down on it when it's just a little seedling, you watch with excitement as it turns into a fully fledged plant! Or to put it another way - treat it like learning any new skill...who ever tells a bub that they're not good enough if they only manage to crawl a centimetre the first time, or take one wobbly step before falling back down on their bum. Nope - all you do is encourage and tell them to get back up and give it another crack. And you keep encouraging them until they're off and running...then wonder whey you wanted them to walk. Anyway, remember to keep encouraging yourself when you decide to change an old habit or learn something new - you can do it!